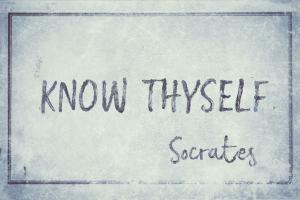 Thank you, Socrates and Shakespeare. However, that “know myself” journey can be challenging sometimes. First, know yourself to be a beautiful soul. Then, consider how well do you know your real self apart from the constructs of society or from what you were taught from your earliest years. Yes, your real self is a good, kind, loving being. This is true even if you have thoughts and feelings that say otherwise. Once you clarify your bigger picture as a soul in this school of planet earth, you realize what is you and what is not. A key is to open up your clear inner communication. As you do so, you know the truth for yourself and not from anyone else’s beliefs or dogma. A hat goes off to sincere seekers—to people willing to look into their many good qualities and also the parts that could use understanding and healing. That inner journey is clearer when it is without the shellac of excessive thinking, dogma or theory. In addition, when we hold this picture of who we are and what we are doing with our life, this discovery of our true identity, our uniqueness and our purpose is fun, adventurous and fulfilling. Keep in mind that we all have joy, caring and love within. Also, we have our own answers and angels to help us see and know our own truth. They can help us bring into focus our core soul being. Join us for a new series: 12 Keys to Discovering your Real Self with the Angels. Through our new series you may find fresh perspectives, answers and deeper insights into yourself. Clarifying your self-image is where it begins in this series. Self-image can be a fundamental influence on your direction and how well you do in life. Click to discover more in this Blog Article and interact live with us in a FaceBook Live Session.